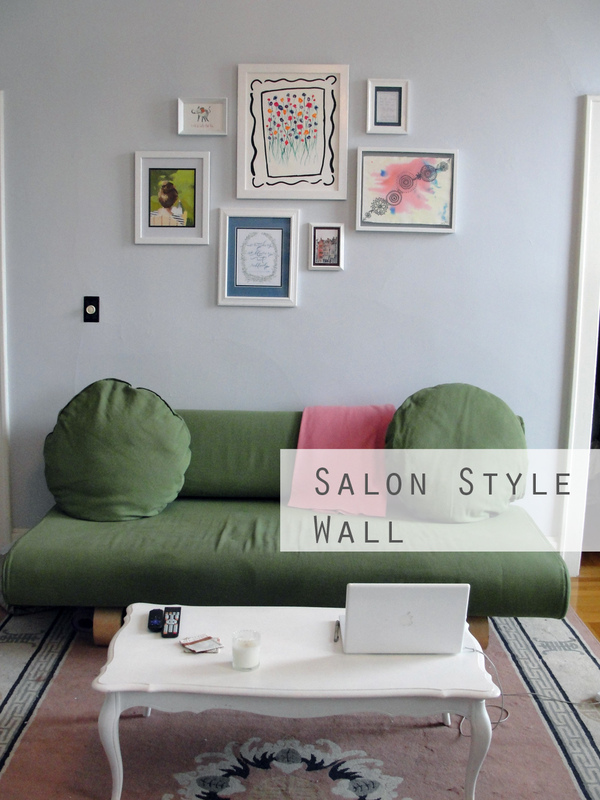 I decided I wanted a salon-style wall in my living room for above my couch. That’s my fancy way of saying I wanted a grouping of framed art hung in an organic way. First, I gathered my art. Some of the pieces I already had, but I also did significant shopping online. I purchased all of my new pieces off Etsy, and spent a lot of time combing for good art at an affordable price. Tomorrow I’ll discuss each piece of work on my wall, where it came from, and how much it was. 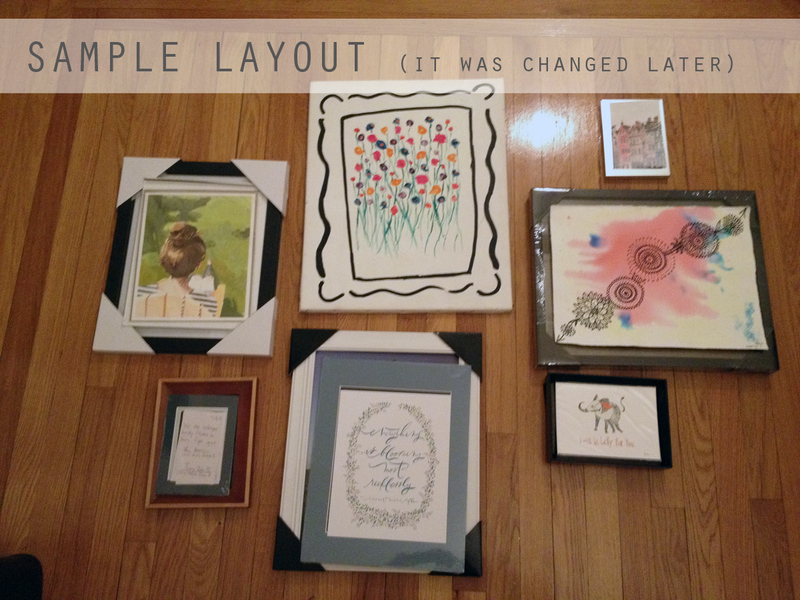 Next, I framed each piece. I purchased some frames at Michaels and AC Moore, combining coupons with discounts at each location. For the smaller art, I used frames that I already had. To make sure I was ready to move forward, I laid the grouping out on the floor. It looked good, so I continued. To keep everything consistent, I painted the frames all the same color white. I even “repainted” the white frames so that they would have the same finish. For the dark frames, I first used a coat of primer. This helped immensely in getting coverage. Then I used the glossy “Decorators White” paint from refinishing the mirror in my living room. I’m glad I had paint left over from that previous project so that colors would match throughout the room. 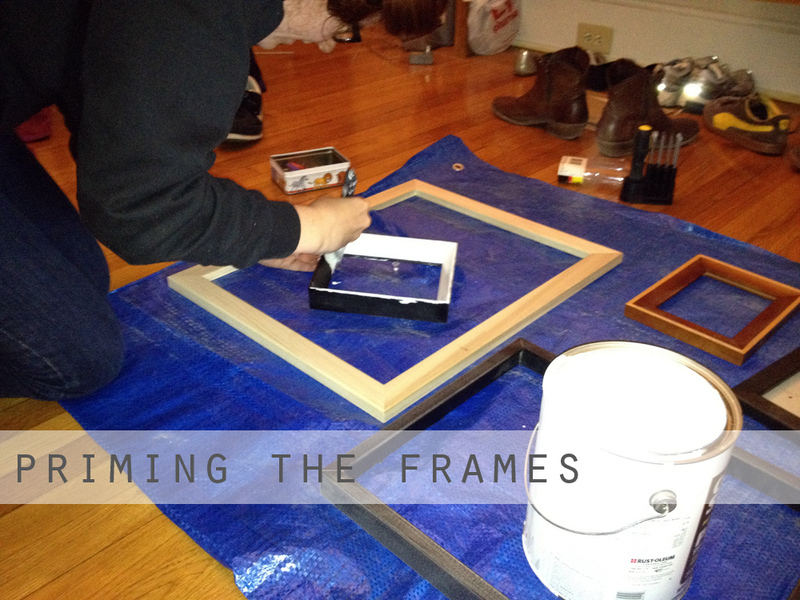 Once everything was reassembled in white frames, I planned the layout again and called my friend Alana for help. To hang, we first found the center of the wall, choosing a slightly high focal point because: 1. I have high ceilings and 2. We wanted to avoid the couch a little bit. We hung the largest, middle piece first, and continued around. I have seen dozens of tips online for how to hang work. In our case, we would hold the piece where we wanted it and mark the top with pencil on the wall. Then we’d measure how much further down the hanging instrument is (the D ring or saw tooth on the back of the frame, whatever it was). We’d move the mark with the care of a ruler, and hammer in a nail. I am extremely pleased on how the salon-hung pieces came out. The living room looks so much better. Tomorrow I’ll post each piece, where it came from, and how much this project cost. Wow, that looks really awesome! I have me some wall envy! Thanks! With my friend’s help in hanging, it was actually quite simple!